ilustrating the swarm of objects in low Earth orbit. WHAT IS ORBITAL SPACE DEBRIS? Space debris exists throughout all regions of space that we have so far been able to observe, and it has done so for a very long time. We refer to this as natural space debris. It is present in the solar system, in other stellar systems, in the space between stars and in the space between galaxies. Some of this debris hinders our direct observation of various regions. An example of this is the dust that obscures much of the milky way, including our galactic centre from our vision. This is seen as dark clouds in the night sky. One prominent southern hemisphere dust cloud is the 'Coal Sack', just to the left of the Southern Cross. 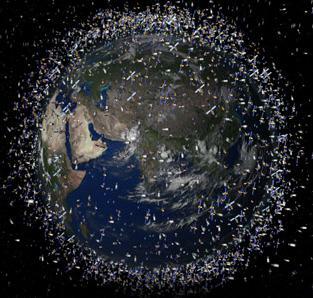 What is new since the start of the space age is the presence of artificial space debris in orbit around the Earth. This comes from man's activities in space, and it is starting to cause us problems. This guide will concentrate on discussing artificial orbital space debris, although comparison will occasionally be made with the natural space debris near the Earth. The first satellite launched into space was the Soviet Sputnik-1. This was placed into low Earth orbit on 4 October 1957. As well as the 58 cm diameter sphere (mass 84 kg) which was Sputnik-1, the final stage of the launcher with a length of 30 m and a mass of 4000 kg also made it to orbit. Also in orbit was the protective shroud enclosing the satellite during the ascent through the atmosphere. And the mating adaptor from which the satellite was released. And probably smaller debris resulting from the pyrotechnic release of the shroud etc. And so was born the first orbital artificial space debris. An interesting space launch which resulted in a scientific uproar at the time was conducted by the US Army. The project was devised by scientists of the Massachussetts Institute of Technology in the time before global communication satellites. 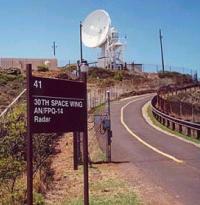 Its purpose was to allow military X-band (8 GHz) communication between the east and west coast of the USA. 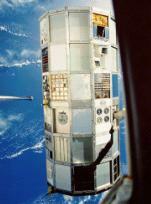 It involved the launch, in May 1963, of 500 million copper dipoles (wires) into a 3600km circular orbit. Each dipole was 25mm long and 2.5 microns in diameter. There were worldwide complaints made about this experiment. Astronomers in particular were concerned that the dipoles would affect both optical and radio astronomy. Two prominent British astronomers, Bernard Lovell and Martin Ryle published a scientific paper about the possible effects in the prestigious journal "Monthly Notices of the Royal Astronomical Society". It turned out that none of predicted dire consequences eventuated. It also was fairly much a failure in terms of military communication. The particles dispersed rapidly and no one could detect them after a few months. Because of their large area to mass, it was assumed that they would all reenter the Earth's atmosphere and burn up within a few years. It is thus was quite unexpected when a few years ago a sensitive radar detected over 40,000 clumps of these dipoles still in orbit. The generation of artifical space debris has continued throughout the space age. The graph below, from the NASA Orbital Debris Program Office shows the number of space objects tracked and catalogued by the US Space Surveillance Network. The categories of object are broken down into spacecraft, orbiting rocket bodies, mission-related debris (eg payload shrouds), and fragmentation debris. Although the graph indicates that approximately 3000 spacecraft are currently in orbit, not all of these are operational. Those satellites that have either failed or reached the end of their useful life also contribute to the numbers of space debris. In general all objects shown here will be 10cm or greater in size, as that is limit below which current tracking is not possible. Also not shown on the graph are several thousand space objects that are being tracked but that have not been catalogued. Note that fragmentation debris is by far the largest contributor to the total number of objects on the graph. These are objects that have been created from other objects already in orbit. The three recent step increases in this population are from 3 collisions, the first two deliberate, and the third accidental. As well as artificial space debris there is also a population of natural space debris (meteoroids) that, while they don't orbit the Earth, do pass through all orbital altitudes. In fact prior to the space age, some scientists predicted that the hazard from natural debris might be so great as to make space travel very dangerous. In fact NASA spent considerable effort in trying to evaluate this hazard. Ground visual and radar observations were examined, and most of the early satellite carried meteoroid detectors. 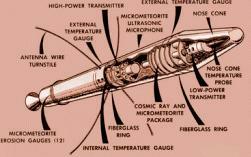 The early satellite detectors were often microphones to record the sound of a meteoroid impact. A large number of impacts were recorded by these detectors and this appeared to reinforce the idea of a large natural orbiting debris cloud. This was referred to as an anomalous debris cloud because it indicated a population much larger than ground observations (mainly radar) could account for. Continued investigation found that microphone type detectors were registering impacts that were in fact expansion and contraction noises of satellite panels. And thus it was found that the meteoroid collision hazard is usually low but not negligible. 1995 was the year in which artificial space debris numbers exceeded the natural space debris flux in low Earth orbit for all particle sizes above 1mm. We might define orbital space debris as essentially any object in Earth orbit that does not have a useful purpose. Below is one classification of Earth orbiting space objects. This has been drawn from the volume 'Orbital Debris: A Technical Assessment' by the US National Research Council, and shows the wide range of sources that contribute and make up orbital space debris. The debris population is measured with the use of both ground and space sensors. And models have been developed to interpolate in size regions where sensors do not cover and to extrapolate to objects not accessible to sensors. Models are also used to propagate debris populations forward in time to examine the future consequences of various scenarios. Low frequency meteor radar for continuous surveillance. These normally operate in the frequency range from 20 to 50 MHz. A single radar can observe a collection area of around 1000 square kilometres. The newer meteor radars can provide directional and velocity information. Visual and/or video observations are sometimes used to augment the radar patrols for better characterisation of the meteoroid that produces the meteor phenomenon. Artificial space debris requires considerably more resources to monitor because of the constantly changing environment, and the need to assign specific space objects to specific space events (eg producing an object catalog). Both optical and radar ground based sensors are used. Space based sensors are also starting to be used for space object surveillance. Special spacecraft with collection panels and other passive monitors have been left in low Earth orbit and then retrieved. Examination of the impacts on these satellites give very useful information about the smaller sizes of debris objects - those which are much too small to be detected by other sensors. Another view of the overall orbital space debris population, both measured and extrapolated down to very small sizes, is shown in the NASA graph below. This also indicates the different means used to monitor this population. The smallest debris populations are estimated from microscopic examination of spacecraft panels that have been exposed to this flux in orbit. Much of this data has come from the NASA Long Duration Exposure Facility (LDEF), shown below together with a closeup of one panel that shows a multitude of small impacts. Both the USA and Russia (and/or the former Soviet Union) have set up tracking networks to monitor the orbital space object population. The European Union is now starting to develop its own capability in this area. Both the US Space Command and the Russian Space Agency maintain space object catalogs. 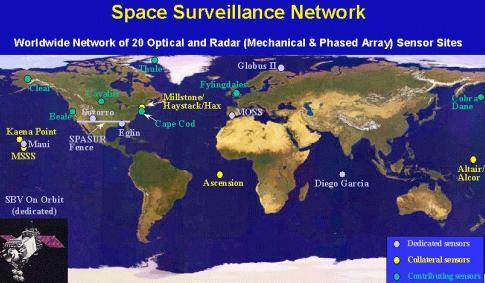 The US Space Surveillance Network (SSN) employs about 30 global sensors to feed its catalog. Details of the Russian space tracking network are not as well known but include mobile maritime platforms, such as the one shown below. The primary SSN optical sensors are constituted in the GEODSS (Ground-based Electro-Optical Deep Space Surveillance) network. This consists of two one metre telescopes and one 40 cm telescope. They observe objects out to geosynchronous orbit, and are stated to be able to see baseball size objects at the latter distance. There are currently three operational GEODSS sites in New Mexico, Hawaii and Diego Garcia. 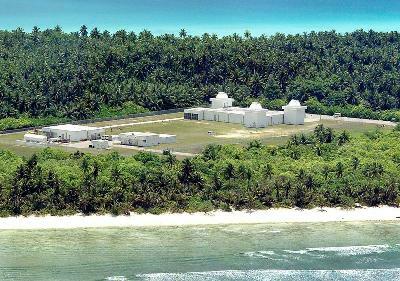 The Diego Garcia site is shown below. These sites are also being augmented by smaller optical telescopes at various global locations. The most data productive site in the Space Surveillance Network is a radar 'fence' that has been set up across the width of the North American continent. This sensor is called the SPASUR. It was intially operated by the US Navy under the name NAVSPASUR, but has recently been taken over by the US Air Force. The main transmitter in this system is located near Lake Kickapoo (named after a local Indian tribe) in Northern Texas. The transmitting complex comprises transmitter and antenna elements spread over a north-south distance of more than 3 kilometres. The total effective radiated power is over six billion watts. It is probably the most powerful transmitter in the world. And if ET is out there, this is the terrestrial transmitter he is most likely to hear first. This space fence is in essence a fan bean of radio energy that is very narrow in the north-south direction, but that spreads to cover the continental US in the east-west direction. Any orbital object that crosses this beam (and most of them do) will reflect a portion of the radio energy back to Earth where it will be detected by several radio receivers completing the SPASUR system. On the order of 10,000 observations each day are processed by this space sensor. It forms the backbone of the US Space Surveillance Network because it can monitor such a large area of space - it does have to be guided to track specific objects as do most of the other sensors in the network. Currently the SPASUR operates at a relatively low frequency (217 MHz). It is due to be upgraded to S-band (~ 2 GHz) for higher accuracy. Tracking radars are used to provide greater precision meausrements of range, velocity and direction. 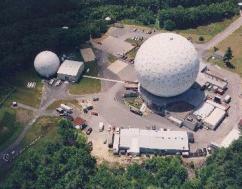 These are of two sorts, those that track mechanically, and phased array radars that can track electronically. The SSN also has various collaborating sensors which are used part time for operational tracking and part time for special space debris research programs and campaigns. Data from all SSN sensors is sent to the Space Control Center underneath Cheyenne mountain near Colorado Springs. Data is processed and produces the SATCAT or satellite catalog of orbital objects, either as a state vector or Keplerian orbital elements. Data is made available to registered users via the NASA Orbital Information Group (OIG). Since 2002 only approved parties are issued registration. This includes most US entities and entities of friendly states. Data does not include orbital elements of US military satellites. A subset of the SATCAT is freely available on the web via Celestrak. While this is very useful for tracking most active satellites, it is of no use for conjunction assessment (CONASS) and subsequent collision avoidance (COLA) purposes. Many governments (particularly European) have expressed frustration with data delays and denials, and perceived data degradation, and ESA has proposed a European tracking system for "space situational awareness". At present they use two radars and a dedicated optical telescope at Tenerife to observe high interest items and produce very limited local catalogs. 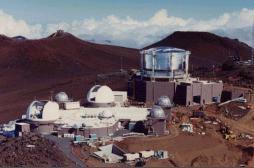 Other telescopes are being enlisted to help in this task. A group of dedicated amateur satellite observers track and produce orbital elements for most US military satellites - these can be accessed via SEESAT. These problems are now discussed in more detail. Most reentering space debris ablates totally as it passes through increasingly dense atmosphere in a fiery conflagration. Only the largest objects (usually > 10 tons initial mass) partially survive the reentry process. Fragments normally fall to ground at their terminal velocity which may range from almost zero to ~ 200 m/s. Abrasion of optical surfaces of satellite sensors by prolific micron sized particles. Reduces sensor life. Early particle collection experiments (eg Skylab) found titanium in space - assigned a solar origin. The probability is extremely low, but this woman was 'hit' by a piece of thermal blanket from the US MSX satellite. NASA now routinely conducts a survivability analysis on all large satellites. In the early 1970's US gamma ray detectors on some scientific satellites detected strange events. The US military classified some of this data in 1973. It turned out that Soviet RORSAT (Radar Ocean Reconnaisance) satellites were carrying nuclear reactors to provide enough energy to run the high power radars. One of these satellites (Cosmos 954) survived reentry over Canada on Jan 24, 1978 and scattered radioactive material. The Canadian government presented the Soviets with a $6M cleanup bill. To avoid similar problems, further satellites ejected the reactor cores to higher altitudes at the end of the satellite useful like. However, this process has resulted in the release of highly radioactive NaK (sodium-potassium) coolant particles. These droplets represent a unique space debris class. Abrasion of optical surfaces on satellite sensors by prolific micron sized debris particles can reduce sensor life. Mistaken identity: early space particle collection experiments (eg by Skylab) found titanium in space. It was initially thought that this must have come from the Sun. Later on it was found be from paint that had flaked off various orbital rocket bodies and some satellites. 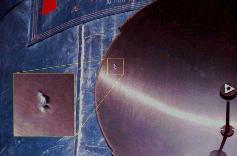 On 23 May 1985 a Greek astronomer captures on film a flash from the part of the Moon's surface not illuminated by the Sun. Such transient lunar phenomenon or TLP have always been a much debated topic, but this appears to settle the matter once and for all. Could it be a meteoroid impact, a volcanic eruption/outgassing or maybe some kind of ionisation phenomenon. It turned out to be none of these. Several years later satellite investigators showed that it was in fact a glint off a derelict US military weather satellite. Several other claimed new astronomical phenomenon have later been revealed to be due to space debris. 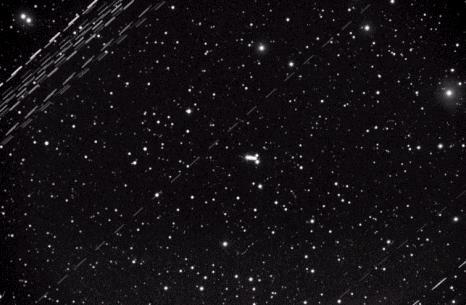 Space object trails showing up on astronomical images is becoming an increasing problem. A recent astronomical imagery book by a famous astrophotography containing about 200 spectaculat astronomical images had satellite/debris trails across a dozen of them. 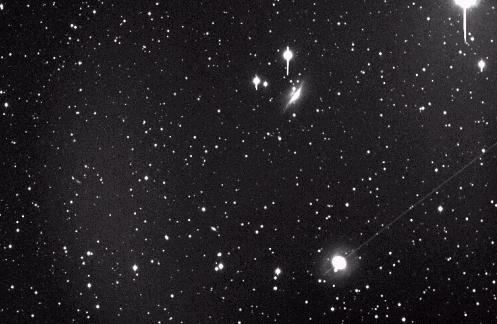 A trail through a beautiful galactic image that has taken several hours to expose can be very frustrating, but in photometric research where many hundreds of images are often processed manually without human oversight, a trail through the target object could result in false data. When photographing near the celestial equator the problem becomes a lot worse because of the number of large satellites and debris objects that are in or near geosynchronous orbit. The following image shows almost 20 trails from these objects over a total of one hour exposure. Imaging was interrupted every 10 seconds for 10 seconds to allow underlying fainter objects to be seen. The bright short trail in the center of the image is the asteroid Vesta. Skyglow is the sky brightness between the stars. This comes from a number of sources: scattering from aerosols and chemical reactions in the lowest ionosphere (~80 km). When the concentration of 100 micron sized debris particles becomes very large, this may be the predominant skyglow source. Skyglow limits ground imaging magnitudes. Large pieces of space debris, as well as operational spacecraft, will reflect radio signals from ground transmitters back to the ground. Meteors do the same thing, but usually at frequencies <200 MHz. Metallic debris will echo microwave frequencies. Even radio quiet zones cannot legislate against this type of transient interference. It is not easy to predict the visibility, from the ground, of a space object. Many factors influence the actual brightness, but we can make a rough estimate by considering a spherical object that is half illuminated by the Sun when directly overhead an observer. The albedo (reflection coefficient) of the object is assumed to be around 0.1, a value not atypical for an object in low Earth orbit. The graph below is a guide to the brightness of such an object as a function of object altitude and size. The brightness is given in astronomical magnitudes, where the brightest star Sirius has a magnitude of -1 and 6 is the faintest magnituide visible to the unaided eye. A hypervelocity collision is defined as one wherein the kinetic energy of the impactor is greater than the explosive energy released by the same mass of high explosive (eg TNT). A hypervelocity collision displays more properties of an explosion than a typical low velocity collision. The average relative collisional velocity in low Earth orbit is around 10 km/s (compared to the typical orbital velocity of 7 to 8 km/s), and thus practically all space debris collisions in LEO will be hypervelocity collisions. The impactor is usually totally destroyed. Even paint flakes can cause problems. 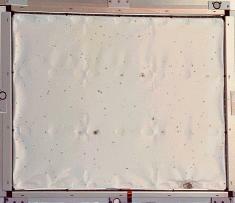 Over 100 space shuttle windows have had to have been replaced due to debris cratering (at $100k a window). At right is a paint flake that has been captured by a remarkable substance known as aerogel. 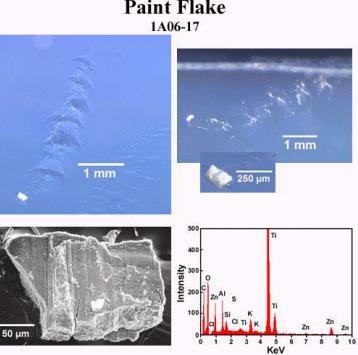 Analysis shows the presence of titanium, part of the white pigment in paint. Just to show that natural space debris has a non-negligible impact hazard, a window of the space shuttle STS-126 was cratered by a micrometeorite. 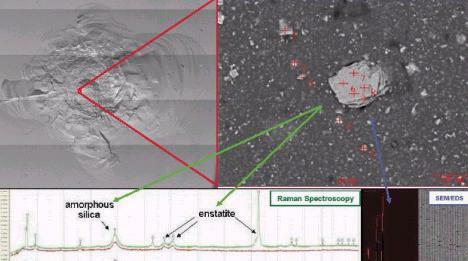 That it was natural and not artificial space debris is shown in the chemical analysis of the cratering residue, which contained not titanium but minerals found in meteorites. At right is an impact crater discovered on a Hubble Space Telescope solar panel. STS-118 radiator impact damage. The ingress hole is almost 10mm diameter. The exit hole is much larger and very irregular. This is typical of all penetrating impacts. 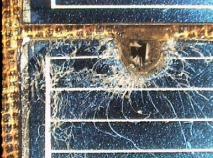 At right is a hole found in the Hubble downlink antenna, the result of a space debris impact. Any impactor over 10mm in size is bad news for any spacecraft. The graph below gives a rough guide to penetration depth as a function of impactor size and speed. The ordinate is an aluminium equivalent thickness in millimetres. At right is a ground based hypervelocity impact of a 2mm Al sphere into an Al target 18mm in thickness. Note crater and incipient spall opposite impact. Note that the sphere shown in the bottom of the crater is indicative only - the actual impactor, identical in size, was totally destroyed in the impact. 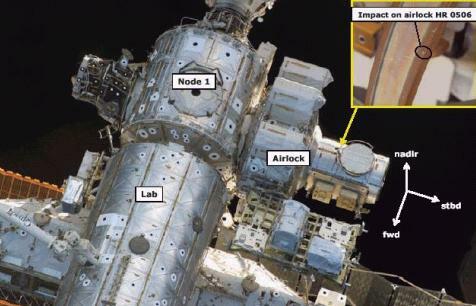 The NASA image below shows the location of a small debris impact crater on the handrail of an airlock on the international space station. At first thought one might tend to disregard such a minor event. But imagine if you were an astronaut running your hand around this handrail. And it just happened to tear your glove, allowing your spacesuit to slowly depressurise ....! 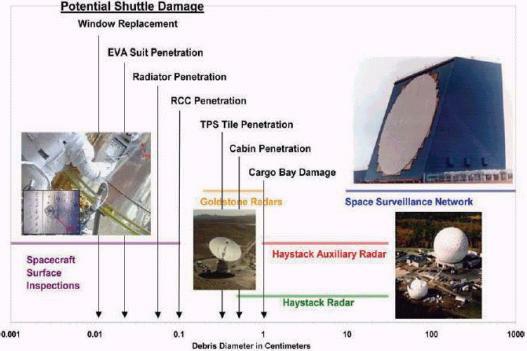 The figure below, from the NASA Orbital Debris Program Office shows well the damage that impactors of various sizes might cause to a space shuttle. The orbital space debris population is a function of debris source and debris sinks. We shall now examine various sinks and source in more detail. Solid rocket fuel is a profligate producer of space debris. Slag particles from the exhaust may range from microns to centimetres. This source currently accounts for the majority of artificial orbital space debris. These may be deliberate or accidental. The Soviets used to routinely destroy satellites at end of life to preserve secrecy. Cosmos 2421 recently underwent a severe fragmentation producing over 250 trackable fragments. Accidental fragmentation typically occurs due to the release of stored energy, either from unspent fuel or batteries. Hypergolic fuels are notorious. In Delta rockets the separation wall between fuel (hydrazine) and oxidiser (nitrogen tetroxide) would erode and spontaneous reaction would take place, fragmenting the upper stage motor and casing into a major debris source. From 1961 to present there have been approximately 250 known fragmentations. Only four accidental collisions have been recorded to date. The current low probability of collision makes this a minor source of space debris - at the present time. The Soviets used in-orbit satellites to close on the target satellite. The antisatellite satellite would then be exploded, showering the target with debris. 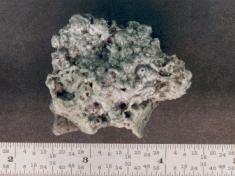 Approximately 20 ASAT tests of this nature were believed to have been conducted in the Soviet era. No Russian ASAT test has been conducted over the last two decades, although a senior Russian military general has recently indicated that tests may soon resume due to the recent Chinese and US tests. The first 4 US ASAT tests were conducted by firing a missile from an F-15 fighter in a steep climb. The P-78 solwind satellite was destroyed on 3 Sep 1985. The last of these tests was conducted in October 1986. The program was terminated by Congress. The last and most recent test was conducted by an SM-3 missile launched from a USN Aegis class destroyer. The satellite destroyed was the failed intelligence USA-193 craft. The reason given was reentry debris mitigation, but may have also been secrecy related. 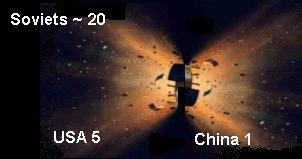 On 12 Jan 2007 China launched a ground based missile and destroyed an old meteorological satellite, creating the worst debris cloud in the history of space flight. The object population in low Earth orbit before and after this collision is shown in the NASA plot below. Analysing collision requires a laborious collection of data, making sure that all object orbits collected do indeed belong to the specified event, and that all possible tracked objects have been collected. One of the most useful aids to analyse collisions is known as the Gabbard diagram, after John Gabbard of NASA. A Gabbard diagram is a plot of the perigee and apogee altitudes of each object in the collision versus its orbital period. The intersection of the two 'arms' is the collisional height. In 1978 two NASA employees wrote a paper that was published in the Journal of Geophysical Research. Its title was "Collision Frequency of Artificial Satellites: The Creation of a Debris Belt" and the authors were Donald Kessler and Burt Cours-Palais. This was written before any accidental had happened. It pointed out that when the debris numbers in low Earth orbit become great enough, a chain reaction could occur that would rapidly increase the debris population to a point where normal satellite operations would no longer be possible. Today this scenario is termed the "Kessler Syndrome". In a Science paper published Jan 2006, Kessler's successor states that the debris population is now sufficient, that without any further launches to LEO, collisional cascading will exponentially increase the space debris population, it becoming the dominant production mechanism in 50 yrs. A small but important amount of the Earth's atmosphere extends to an altitude of 1000 km or more. This will cause aerodynamic drag on all satellites with the following very approximate decay times. The above table assumes an average mass to area ratio of around 100 kg per square metre(the range encountered in larger space objects is usually between 50 and 200), and a drag coefficient CD ~ 2. US and European researchers have developed computer models to describe the current orbital object population and allow this to be propagated into the future under various assumptions. A simple model developed by Farinella and Cordelli at the Universtry of Pisa (Italy) serves to illustrate to basic evolution of an orbital population. It can be coded easily and quickly and serves as a good student exercise which is not clouded by too many details. One output from this model is shown below. The inferences we draw from these models is that low Earth orbit, in the absence of delibrate debris reduction measures, will probably become unusable in a few hundred years. Exactly how many years will depend greatly on the number of continuing fragmentations and deliberate collisions we see in the near future. A war in which space assets are targeted would be catastrophic. And we must remember that it is not only space activities that will. Astronomy and other ground based activities will be affected as well. Several decades ago, the intrepid explorer Thor Heyrdahl told us that the Earth's oceans were a finite resource, and that we couldn't continue to dump waste cargo into them without experiencing problems in the future. It is sobering to realise that low Earth orbit, with its staggering volume of one trillion cubic kilometres, is likewise a finite resource that we must use wisely. 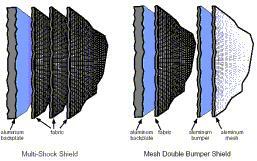 In the early 1950's Fred Whipple suggested the 'bumper shield' as a mass effective way to protect satellites from meteoroid damage. This has been refined over the years, and applied to the largest and most expensive space assets such as the International Space Station, to provide protection mainly against orbital space debris. The last item applies only to geosynchronous orbit. Now these guidelines are fine and if adopted should minimise the generation of debris from continuiung space activities. However, the only thing that will really solve the problem is the active removal of debris from low Earth orbit. Many different ideas have been proposed, and the first conference on this problem was held in early 2010. However, no consensus was reached. All active solutions so far are very expensive and engineering nightmares. The most plausible scheme is arguably that of laser deorbit. This involves a ground based laser beam used to cause surface ablation of debris less than one kg in mass to produce a reaction force which lowers the perigee of the object for a rapid atmospheric decay. One such published scheme would deploy a 5 MW peak power (30 kW average power) laser to deorbit the 1 to 20 cm sized debris population over a 2 year period at a total cost of $200 million. Although this appears reasonable, there are many scientific and engineering problems to be solved. But overiding all these are the political hurdles that would need to be overcome to deploy such a system, and in the end this is probably the biggest problem we face. Conjunction assessment (CONASS) leading to possible collision avoidance (COLA) action are affirmative actions that not only look toward protecting current space assets, but also look toward the possible prevention of further accidental collisions that generate even more space debris. The Iridium-Cosmos collision should not have happened. It did so only because of insufficient computer resources in CONASS. Prior to this collision CONASS was applied only to high value resources (eg Space Shuttle and ISS). To remedy this deficiency the US Air Force has set up and staffed a new conjunction assessment office. This office has been given a mandate to liase with space industry to try and prevent the repetition of the Iridium collision, and to improve space situational awareness in general. The space shuttle has had to perform a COLA maneuvre about every 10 flights. A recent short notice to the ISS resulted in astronauts sheltering in a Soyuz return capsule. The CONASS warning area is 5km radial and 25km in-orbit. The COLA maneuvre area is 2 km radial and 5km in-orbit. A commercial firm now offers a CONASS service for the space industry. The notion of space debris may seem remote to most Australians. Australia has only a few active satellites in orbit and has generated only a small amount of space debris itself. Unfortunately, everyone is going to be affected by the problem of continuing space debris generation (and the large Australian astronomical community will be in the forefront of secondary effects). It is thus appropriate that Australia should be involved in this international issue. Support, help develop and monitor compliance with UN COPUOS (COmmittee for then Peaceful Uses of Outer Space) mitigation guidelines. The government Space Policy Group has been involved in this area. The Deparment of Industry, Technology and Resources awarded an $8 million industry grant to Electro-Optical Systems (EOS), a Canberra firm, to investigate the laser deorbiting of space debris. Raise awareness of this issue locally and abroad. Avoid using launch facilities of countries that contravene debris mitigation agreements they have signed. Look at setting up a conjunction assessment office in Australia for Australian space assets, and to monitor any potential problems with Australian space debris. This is not a high cost operation. With access to the US satellite catalog, a few high end PC's and two or three staff would be adequate. Support the establishment of space object monitoring and space debris research in Australia. Two facilities for space object monitoring have in fact been set up in Western Australia in the 2009-2010 time frame, one by the US Air Force and one by the University of Western Australia. Australia already has in place a contingency plan for the reentry of radioactive space debris over Australian territory. The phrase 'space situational awareness' is currently the in-phrase amongst the world's space communities, and countries and companies are scrambling to implement the means to be more space situationally aware. A knowledge of the space object population is a large part of SSA. The US Space Surveillance Network is being overwhelmed by the rapid increase in space debris, due primarily to two collisions. There is realisation of an urgent need to upgrade SSN sensors and plans are in hand to do so. Unfortunately the implementation is likely to slip due to fiscal constraints. The European space community is becoming increasingly concerned about reliance on the US for space situational awareness and is scrambling to develop an indigenous capability. However, unless an equivalent wide field sensor to the SPASUR network is developed and deployed they will be struggling to achieve autonomy in this area. Finally, the most pressing issue for space debris at the current moment is the development of a sound scientific method for active removal of space debris from low Earth orbit. Not only must it be engineeringly and financially doable, it must also be politically acceptable. Joseph Loftus was one of the earliest proponents of the importance of space debris. He gained an international reputation in this field, and was known as the godfather of the NASA Orbital Debris Program Office. His efforts led to the funding and establishment of that office in 1979. Donald Kessler was the first Chief Scientist and Program Manager of the NASA Orbital Debris Program Office. He is widely remembered for the 1978 paper on the possibility of collisional cascading leading to a severe orbital debris crisis. This is now referred to as the Kessler syndrome. He was the first to predict the presence of large amounts of small uncataloged space debris. He retired from NASA in 1996 and is now an independent space debris consultant. Nicholas Johnson is the current Chief Scientist and Program Manager for the NASA Orbital Debris Program Office. Prior to this appointment he worked in private industry on space debris problems and as an expert on the Soviet space program. He was the co-author of the first book solely devoted to orbital space debris. John Africano was an astronomer with diverse interests. In the latter part of his life he concentrated on measurements of space debris, working in both the civilian and military communities. He was an avid communicator and educator, and co-organised the annual AMOS Technical Conference on Mauii. Walter Flury, now retired, was a leading European scientist on space debris issues, bringing these to the attention of a wide audience in the 1980's. He was the first coordinator of space activities within ESA and launched the first European Conference on Space Debris in 1993. Heiner Klinkrad is the current head of the European Space Agency Space Debris Office. He assumed this position in 2006. He leads the ESA delegation to the Inter-Agency Space Debris Coordination Committee. CSSI is a research arm of Analytical Graphics Inc (AGI). This guide has concentrated mostly on space debris in low Earth orbit. It is in this regime that the problem of space debris is most acute. However, geosynchronous orbit has problems of its own, and some of these have largely gone unnoticed, because the increased distance to GEO makes detection of smaller objects very difficult with ground based sensors. One of the main differences about geosynchronous orbit is the absence of atmospheric drag and decay as a sink for the debris population. The four main perturbating forces on an object in or near geosynchronous orbit are gravitational forces due to the Earth's oblateness, the Moon and the Sun, and solar radiation pressure. The standard procedure to dispose of a geosat at the end of its life is to boost it into a supersynchronous orbit - that is an orbit above geosynchronous orbit. It is now agreed that these graveyard orbits should be at least 300 km above the active geosynchronous belt. To solve the sensing problem, the US Air Force has recently launched a satellite into GEO that can maneuvre around the orbital belt, allowing both observation of the overall environment, and observation of individual satellites that may experience problems. A NASA simulation of the GEO space object population is shown below. 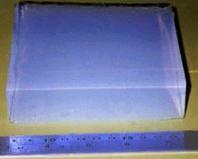 Aerogel is a remarkable manmade material that has a density between on tenth and one hundredth that of water. It is the only known substance that can stop a hypervelocity object without destroying it in the process, and it has allowed us to examine and determine the nature of various particles of space debris. "Artificial Space Debris", Nicholas L Johnson and Darren S McKnight, published by Orbit Book Company Florida, 1987, ISBN 0-89464-012-7. This was the first published book completely devoted to Orbital Space Debris. "Orbital Debris: A Technical Assessment", (US) National Research Council, published by National Academy Press, Washington DC, 1995, ISBN 0-309-05125-8 or ISBN 0-89464-012-7. This book can be accessed at National Academies Press. Unfortunately only two volumes of this journal were ever published. IAA position paper on space debris. IAA paper on space debris mitigation.